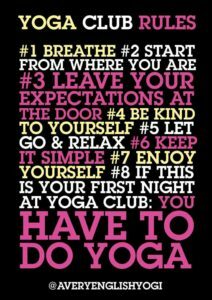 The 4th Yoga Club rule is ‘Be kind to yourself’. It’s a simple rule. But many people find it hard to follow or even consider. They hear or read it and don’t give it too much further thought. It seems too easy. Maybe it seems too, well, kind.. and why would you want to be kind to yourself. You’re here at Yoga Club to “work”, right? Here’s the thing though. If you can’t be kind to yourself. How can you be kind to others? There’s a shed load of evidence out there about the value of compassion and self-compassion (read ‘kindness’), so I will leave this to you to explore. One of the best books out there is The Compassionate Mind by Professor Paul Gilbert. It’s research based, and very practical. For me, the value of being kind to yourself in yoga, particularly yoga asana – is that if you are kind, and gentle to yourself – you aren’t going to force yourself into postures or if you are exploring breathing techniques or reading scripture its not going to cause you pain or discomfort. I’ve heard it said that “if it isn’t hurting, it isn’t working”, particularly in yoga postures or body weight exercise or gym work. But actually, why would you want to hurt yourself?? What drives this masochistic world view? That’s maybe for the psychotherapists and others with an interest in that kind of thing…. The principle of being kind to yourself, naturally follows on from the last yoga club rule which is “leave your expectations at the door”. That was about being curious rather than having a shed load of expectations. This rule takes it further. Ditch the expectations and be kind to yourself. Don’t push yourself beyond where you want to go. Don’t paint yourself into a corner. Embrace curiosity but look after yourself. Patanjali writes in the Yoga Sutras: “sthirasukhamasanam” which loosely translates as “asana must have the dual qualities of alertness and relaxation”. To be alert, yet relaxed, you do need to have a sense of kindness and compassion towards yourself. Don’t force yourself into a pose or posture that hurts you or that you feel is uncomfortable. Be gentle with your body if its an asana. Be gentle with your breathing if its pranayama. Be easy on your mind if you are reading scripture and you are struggling. If you are trying to meditate – cut yourself some slack and try for 5 minutes – not 30 minutes. Patanjali goes further though. In chapter 2, verse 30 of the Yoga Sutras, he introduces us to the yamas. And the first one is called ahimsa. It’s one of six yamas or attitudes towards our environment or world. Ahimsa is a challenging concept. Many take it to mean non violence. By default, adopting a compassion or kindness can help with this. For many, exercise or yoga can be a form of self flagellation – taking out our psycho-dramas and angsts on ourselves in the form of pushing ourselves into ever more challenging postures and poses. But this Yoga Club Rule calls you to avoid that. By all means find your boundaries or edges of yoga practice or of life, but don’t go beyond and find that you are causing yourself pain and suffering. Firstly, there is enough pain and suffering anyway and we need as many people to help alleviate that. But secondly, how can you be kind to others if you can’t be kind to yourself?